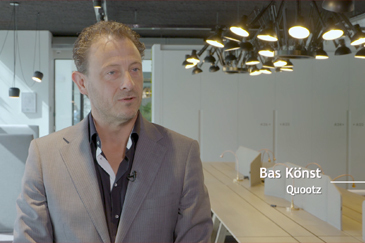 Het Nederlandse bedrijf Quootz BV is ontwikkelaar, distributeur en implementatie partner van geavanceerde software voor product- en salesconfiguratie. With its product “Merkato” Quootz offers the best of both guided buying and product configuration. We want to offer our customers the opportunity to easily sell their products 24/7, worldwide . Hence, our software is 100% web-based and fully multilingual ​​. The software is ready for use “in the cloud”. As a company, we aim for a close relationship with our customers. We find quick reaction times and adequate support of the highest importance. Together we solve your challenges and adjustments in the software are usually carried out the same day. Flexibility, guided buying, long-term relationships, cloud computing and perfect support. That’s Quootz! Quootz BV was founded in October 2010 by Bas Könst and Christiaan ten Klooster. Both Könst and Ten Klooster are originally mechanical engineers with a history in 3D CAD, PDM, parameterisation and modular thinking. Their passion has brought Quootz where it is today. Together with our customers Quootz ensures that products and services are sold 24/7 quickly, globally, flawlessly and in any language. We believe that a flawless sales process and order entry is the basis for a LEAN production process and the prevention of waste downstream. When you work with Quootz, you have direct contact with your own consultant who understands technology, your business and your processes. We know how to help! Quootz is a successful company with a solid foundation, part of a successful holding company. Your processes are put in a software with a base that is used by thousands of people worldwide and is continuously being improved. Everyone at Quootz has years of experience. Because of this we know what you are up to as a company and what the impact is of improving business processes by software. We offer smart solutions! Technology never stops, therefore we never stop. We are constantly improving our products and therefore carry out regular updates. Process improvement and user requirements are important pillars for us.